On older, skinnier boats, it can be difficult to find room even for something as small as a battery. You want to keep cable runs between alternator and battery as short as possible to avoid voltage drop, and locate the battery where it can be secured firmly against movement. A battery box that will contain acid spills and also protect the terminals against a possible short circuit is a sound investment. In order to avoid an overlong cable run from battery to switch, I had to sacrifice a bit of valuable stowage space and locate the starter battery alongside the quarterberth. There was nothing worth keeping, so I started the project by removing the old batteries, cables, and switches. I consulted a voltage-drop table and found that for my installation, with an 80-amp alternator and a maximum cable run of just over 6 feet, AWG 4 battery cable would be more than adequate. I calculated that I would need 21 feet each of positive and negative cable, and some of the prices quoted for marine-grade tinned-wire cable made my eyes water. I ordered the cable, terminals, heat-shrink covering, and a crimping tool from Genuinedealz.com, the online store that offered the best deal at the time. I suffered momentary brain fade once I had all parts in hand and was ready to begin. What to do first? I decided to complete each aspect of the installation before moving on to the next. The switch. After connecting the two 90-amp batteries in parallel, I measured, cut, and installed the positive cables from the alternator to the house battery bank, and from there to the battery switch and the domestic panel. Cutting the cables, paring back the insulation, crimping the terminals on, adding protective heat shrink, and wiring up the switch cost me most of an afternoon, a set of skinned knuckles, and several explosions of temper. I re-used the 0 AWG charging cable from alternator to battery, but everything else was new. The ACR. Next, I mounted the ACR as close as practicable to the batteries, inside the battery compartment. 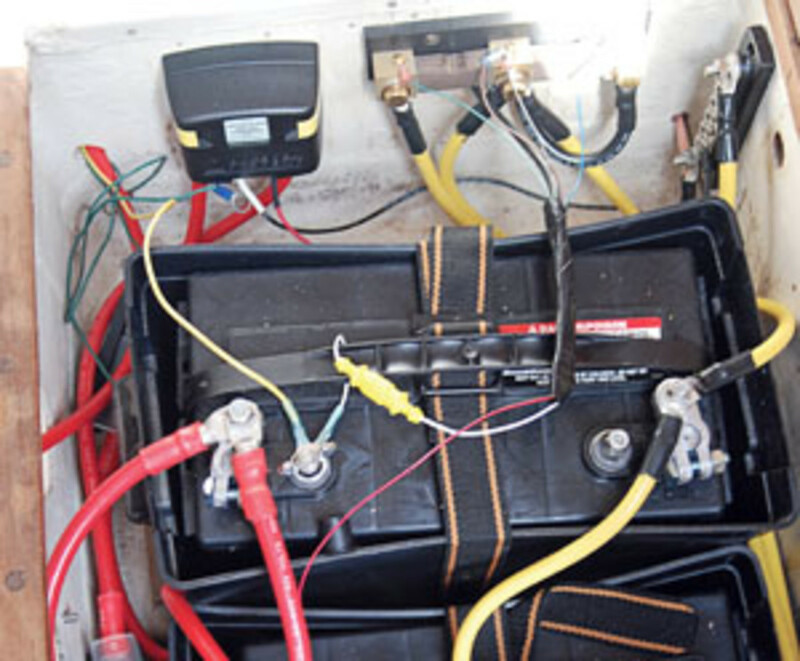 The Blue Sea wiring diagram suggests that the starter battery should be charged first. Nigel Calder’s Boatowner’s Mechanical and Electrical Handbook suggests that the house bank should receive the primary charge, rather than have unregulated charge current running through the smaller starter battery. On a low-capacity system like mine, I doubted it would make any difference. I ran a cable from the starter battery side of the switch to the A terminal of the ACR. From the B terminal, I ran a cable to the house side of the switch. ABYC standards require overcurrent protection in positive DC cables, so I added 100-amp fuses to the cables between the switch and the ACR (Photo 4). Following instructions, I wired up a small LED light to tell me when the batteries were combined. Negative circuit. It’s a good (and tidy) idea to have a common grounding point near the batteries (Photo 5). I installed a busbar in the battery compartment and took all the DC negatives to it, including the negative return for the ACR. Then I ran a single grounding cable down to the engine block. 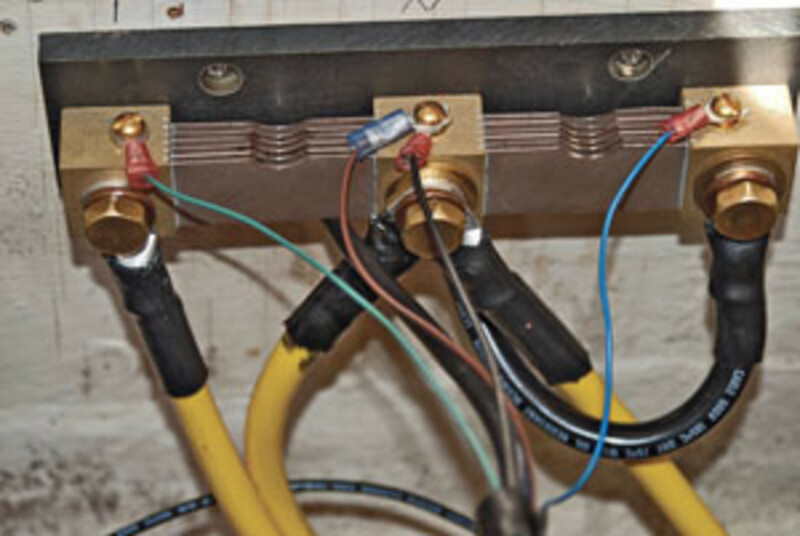 The AC ground should also be connected to this negative busbar. Battery monitor. The DMM-1 came with a dual shunt, which is necessary to measure amps instead of just volts. It had to be wired into the negative return from the battery banks where it measures all incoming and outgoing current (Photo 6). Smaller sensing wires had to be run from the shunt to the various battery banks and to the display, which I mounted above the switch panel. The instructions had seemed confusing to me, but it all became clear once I started. The negative cables from the two battery banks went to the central terminal on the shunt; the negative cable from the switch panel went to the right-hand terminal; and the left-hand terminal was connected to the main grounding busbar. Solar panel. The small Sunsei solar panels sold by West Marine looked like an economical way to keep the batteries trickle-charged. I wired one of the 7.5-watt panels directly to the house bank and took its negative to the common grounding busbar so that the DMM-1 could measure the charging current. It’s topped out at a 0.2 amp charge and has helped keep the batteries in good order during the summer. Apart from checking the electrolyte level in the house batteries (the cranking battery is sealed), I didn’t have to think about the charging system all summer. Voltage in either battery bank never dropped below 12.6 volts between charges. The ACR, which lets the house bank be charged only after the starter battery reaches full charge, obviously does its job well. All I have to do is turn the switch to “on” when I get to the boat and “off” when I leave—which is exactly what I wanted.